Bookride: A Book of Bargains. Vincent O' Sullivan. 1896. "What a midnight his soul seems to walk! And what maladies he draws from the moon." Oscar Wilde on O'Sullivan. Vincent O' Sullivan. A BOOK OF BARGAINS. Leonard Smithers,, London 1896. Several of O'Sullivan's books are much wanted. "A Book of Bargains' does show up at a price but his equally wanted but much rarer 1907 David Nutt published 'Human Affairs' is highly elusive. An American born writer who spent much of his life in Europe at first living well but ending up in the direst poverty. His parent's fortune was mismanged and misappropriated, one of his brothers killed himself over the loss but 'Sullivan carried on stoically. 2 of his books were published by the 1890s decadent publisher of Wilde and Beardsley Leonard Smithers, now a much collected publisher. 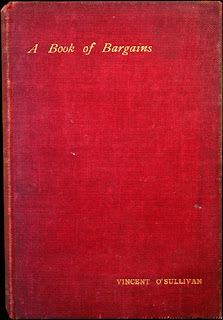 "A Book of Bargains' is a collection of morbid studies and stories somewaht in the line of fellow yank Poe but as Clute and Grant put it 'distinctly fin de siecle in their sin-soaked diabolism.' One of the stories, the after-death nightmare "When I Was Dead" is considered a minor masterpiece. He was a key figure in the decadent movement that was loosely based around 'The Yellow Book', Smithers, Wilde, the Cafe Royal and poets like Dowson and Lionel Johnson. Several of his early works like 'Houses of Sin' (1897) are decadent poetry. They are also wanted and worth money. VALUE? Several online at between £300 and £600, one dealer holding 3 which is not encouraging. To get serious you either want a superb copy or an association copy. The text is prone to foxing. A copy inscribed to Swinburne's friend and protector Theodore Watts Dunton made £420 8 years ago. As mentioned above his 1907 work 'Human Affairs' which has some fantasy stories is more difficult, much wanted and probably of equal or greater value. 'Houses of Sin' isn't especially scarce - in fact I think I have a copy online somehere. Decadence is one of those movements where each writer tries to take it a little further. Front runners usually include Wilde, Huysmans, Rimbaud, Baudelaire, Wedekind, Viereck, Wratislaw, Kuzmin, Gumiliev,Jean Lorrain, Villiers de l'Isle-Adam, Catulle Mendès, Rachilde, Robert de Montesquiou, Edmund John, Stanislas de Guaita, Count Stenbock, Andre Raffalovitch, Dowson, Ada Leverson, Vernon Lee, Olive Custance and the Eckhart Tolle of the decdent movement Walter 'hard gem like flame' Pater. The leader is usually Lautreamont with his staggeringly decadent Les Chants de Maldoror. In a catalogue entry for this outfit in 2005 Martin Stone came up with a chap who would seem to outdo even Lautreamont. It's Edouard Dubus author of 'Quand Les Violons sont Partis' (Paris 1892) MS wrote: 'A crucial book of symbolist verse, sulphurously decadent. Much admired by fellow poets, Dubus was plagued by insanity, occult delusions and drug addiction, and, on release from an insane asylum, was found dead from a morphine overdose in the pissoir of Place Maubert in the Paris Latin Quarter..." A current description in French echoes Martin's 'sulphurously decadent' - "Figure extrême du mouvement décadent, opiomane et morphinomane...' Dubus takes the biscuit when it comes to decadence. Oh poseur, pimp, and libertine! Oh cynic, sot, and swine! Oh voteries of velvet vice! . . .
Oh gods of light divine.